From Slob to Exercise Junkie in Two Days Flat! I trust you all had a fabulous Easter / long weekend. 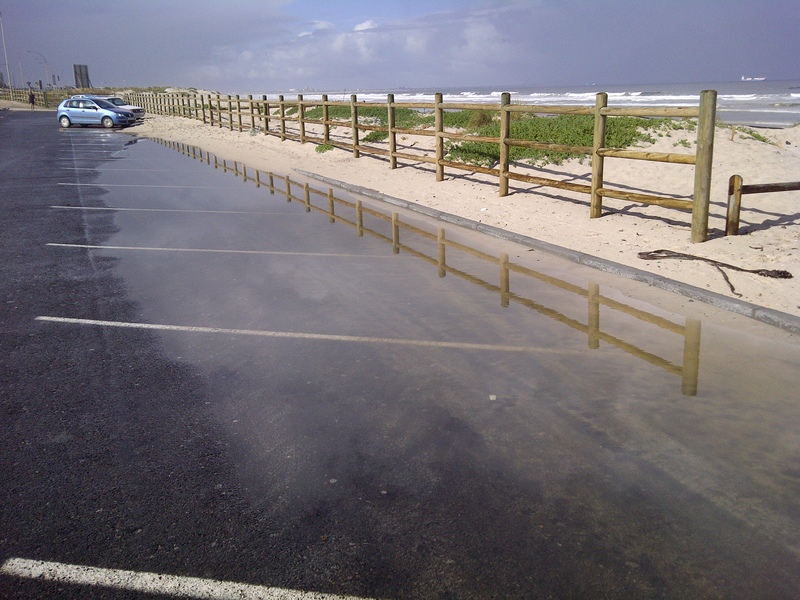 Winter officially arrived in Cape Town this past weekend and it was cold and wet! For the first two days of the long weekend I turned into an absolute and much-needed slob! I got snug and warm and watched endless movies and ate a horrendous amount of Easter eggs. It was sooo good! But Sunday and Monday surely made up for my good-for-nothing-couch-potato state on the first half of the long weekend. On Sunday, Donna and I headed out towards the beachfront to do a long walk. We walked the first part on the beachfront and then veered off to walk some hills before heading back down to the beach. 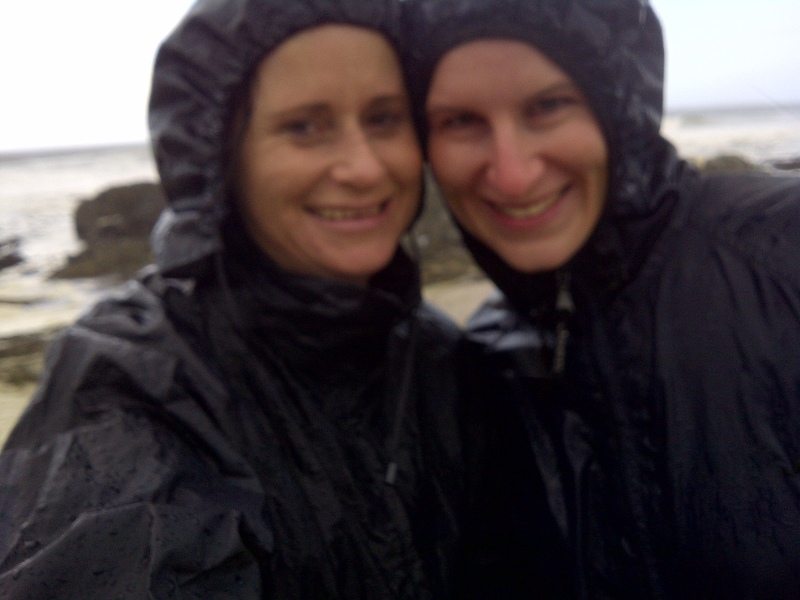 We managed to walk an even, fast paced 8+km’s in cold and wet weather. A stormy Cape Town with Table Mountain almost hidden by the rain clouds across the bay. It was raining, it was cold but we were still smiling and we were still walking! Some scenery along the way. Reflections in the water ~ The sun finally came out for a short while although it didn’t last long. Then early on Monday morning, with the earth still wet from all the rain, I was up at 6am slipping on my hiking boots and heading out to pick Donna up. 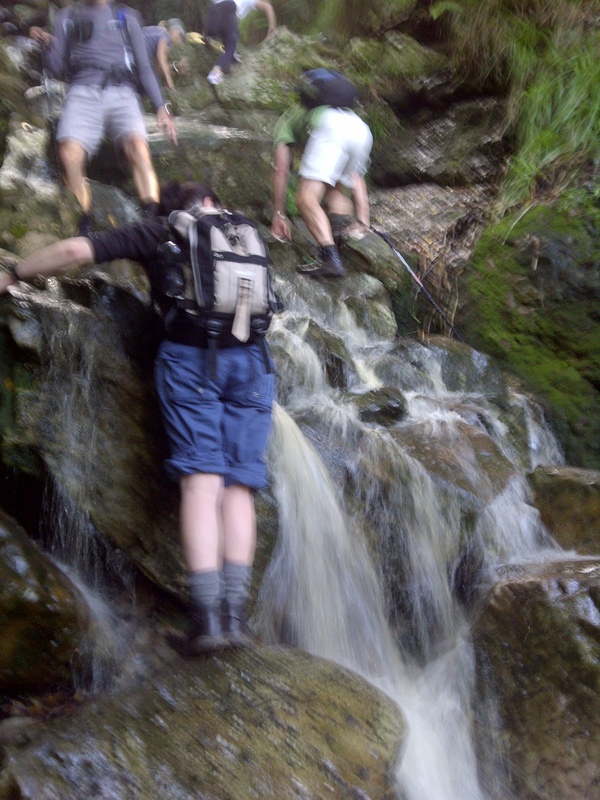 We were meeting Thomas from African Outdoor Adventures and other hikers at Constantia Nek for a training hike. It was a chilly start to the day but once we got moving and we started to climb, we warmed up quickly. We met some awesome people, who were not only great company up the mountain, but kept us entertained! I must admit, I wasn’t overly excited about this hike as the plan was to head up Skeleton Gorge and back down Nursery Ravine, the exact same hike Donna and I had done just two or three weeks ago but I was in for a nice surprise! Besides the hiking trail being wet and muddy, we were greeted to the sight of gushing waterfalls and raging water down the gorge. It was beautiful beyond words! However, never before did this sign mean anything until today….. 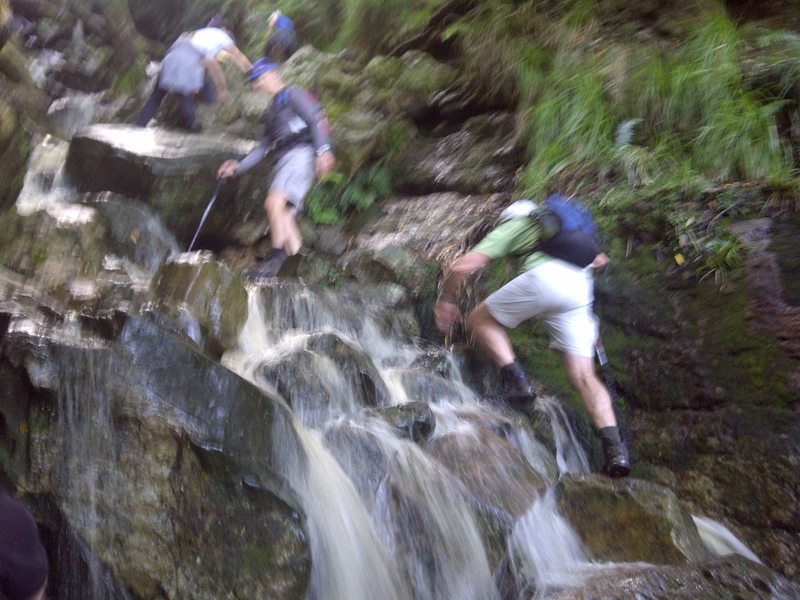 It was almost like we were on a completely different hike, the path from Constantia Nek to the start of Skeleton Gorge was strewn with small rocks, mud and tree debris, which had been washed down the mountain side and upon reaching the gorge we were greeted with the beautiful sound of rushing mountain water! The trail was quieter than a few weeks ago, who could really blame people, it was cold and with the possibility of more rain, if I had a choice I too would have stayed indoors! From the bottom half of the gorge we walked alongside the heavily flowing stream until just after the ladders taking us higher, suddenly we were walking right in the middle of the gorge and zigzagging across the water gushing down. I am seriously delighted to say that my new hiking boots are 100% waterproof and trust me they got wet!!! Making our way up the gorge. Forgive the out of “focusness”, between wet and cold fingers I was trying hard not to slip all the way back down to the bottom of the gorge!!! Donna, Thomas and Helga negotiating their way up the gorge. 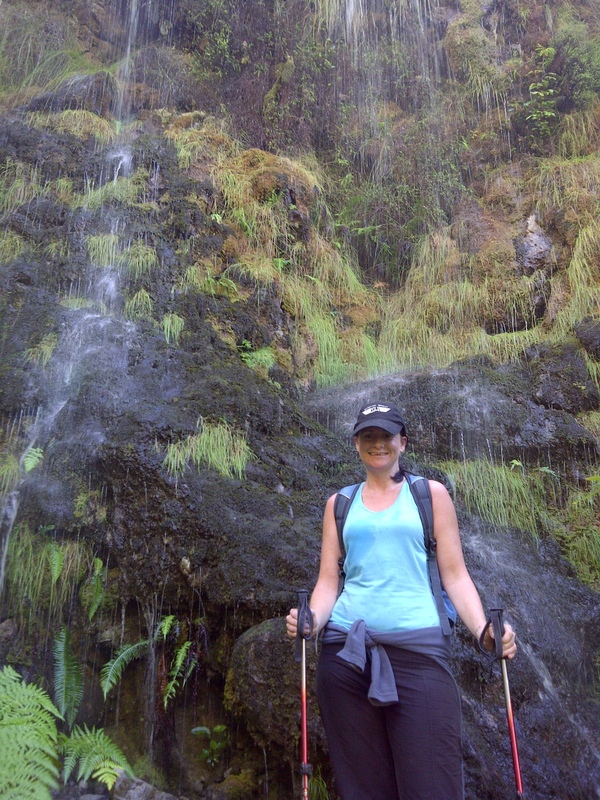 My pants were wet ¾ of the way up due to having to climb up rocks right where the water was rushing down, but after having climbed up hundreds of steep steps on the way up, the ice-cold mountain water was refreshing to say the least! 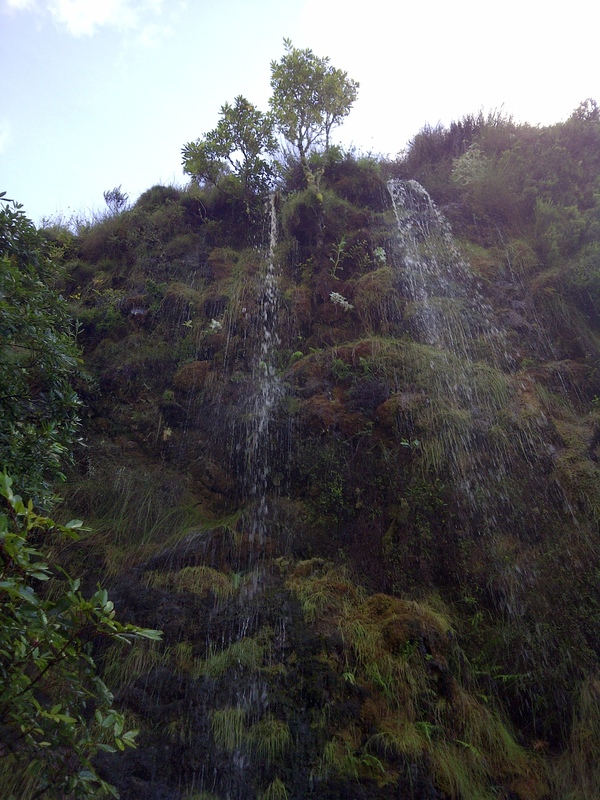 As we got closer to the top, we spotted another beautiful waterfall through the trees. Amazing how a little bit of rain can change a hiking route! Enjoying the coolness of the spray of ice-cold mountain water! Before we knew it we were walking on the beach sand on the top and the Hely-Hutchinson Dam was before us. This time it was deserted. On top of the table, at the Hely-Hutchinson dam. It’s great having good contacts, Thomas who is involved with the Scout movement, had the keys for the Scout cabin on top of the mountain and so we got to have a nice lunch break on top where we could put on the kettle for some tea and we could relax over lunch before heading back down again! The view at the top from our lunch spot. The scout cabin where we stopped for our lunch break. The Hely-Hutchinson dam on top of the mountain. 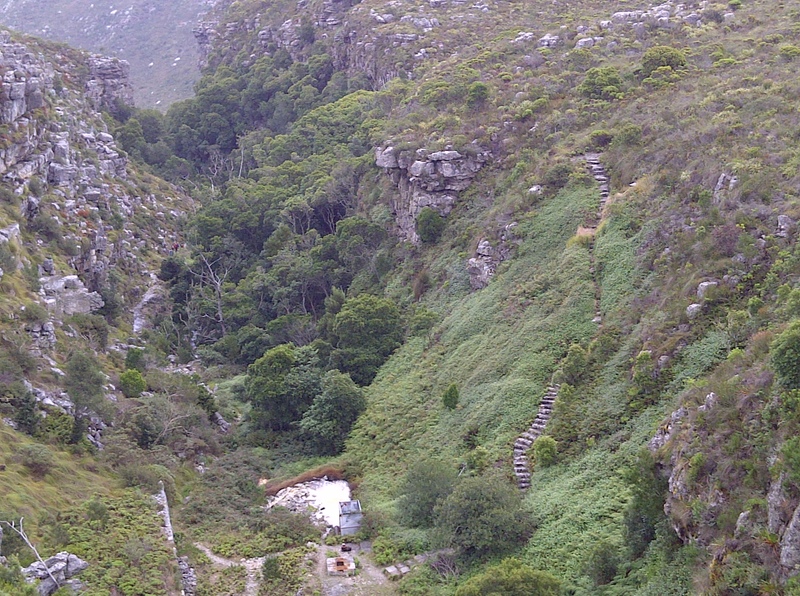 I learnt of a new trail while out hiking, the Orange Kloof Hoerikwaggo 2 Day Trail (32,9 km) ~ This pic is part of it ~ It has a minimum of 2 and a maximum of 12 hikers at a time. You will overnight at the Orange Kloof tented Camps in the heart of the Orange Kloof national forest. 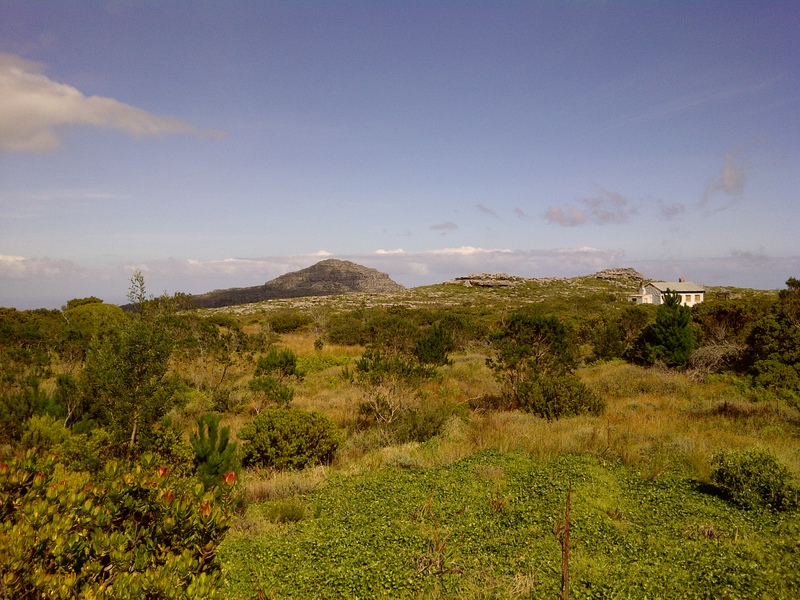 It is a protected area and public access is prohibited unless you are part of this Hoerikwaggo Trail! ~ My kind of trail, a must to add to my list! On our way back down again. The view from the top as we headed back down! We decided not to attempt Nursery Ravine on the way back down due to the steepness of the climb down considering the wet, muddy conditions so we took another route down that eventually hooked up with the Jeep Track and we headed back to the cars where we stopped at Constantia Nek restaurant for a well-deserved drink and to talk Kilimanjaro with Thomas and the others. 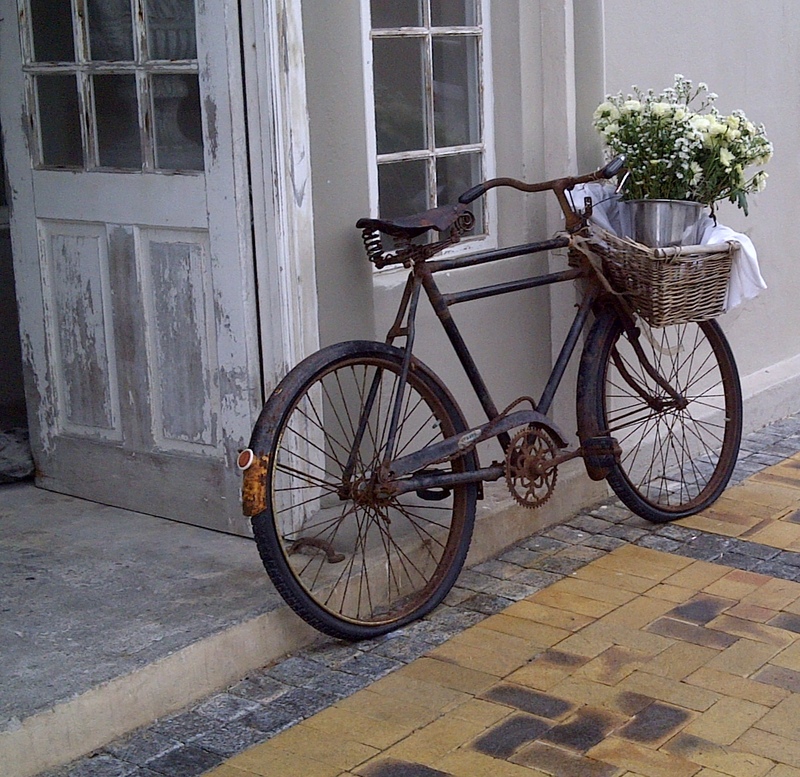 Drinks and chats at Constantia Nek Pub and Restaurant afterwards. The most exciting part is that Donna and I think we have 95% decided on a date to leave and a route. We will be finalising it all on Saturday…. It is all getting so real now! Despite the wet and cold weather this past weekend it was great to be back on the mountain and out in the fresh air getting exercise again. 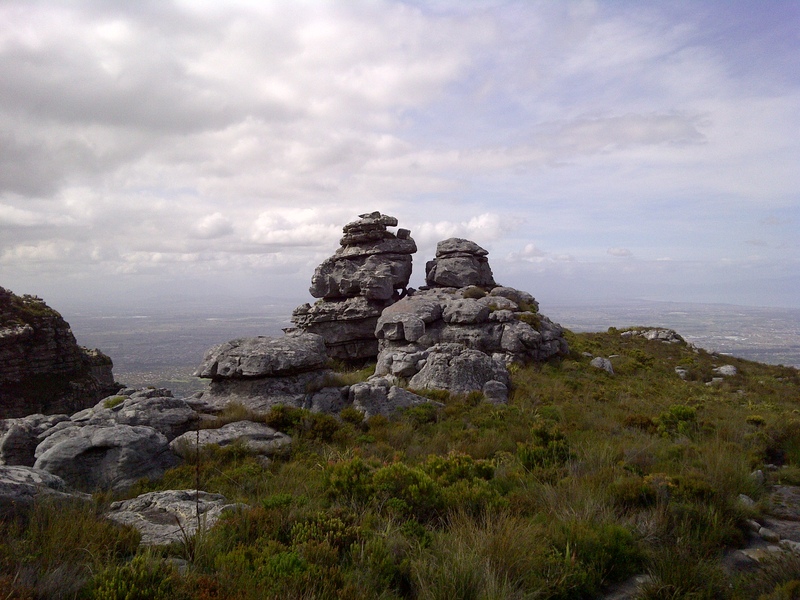 Tomorrow afternoon we are heading out to do a quick climb up Lion’s Head after work ~ at least the sun is due to shine! My body sure did miss the work-outs last week ~ this mountain training is turning me into a fitness freak, haha, who would have thought!